Chocolate Caramel Shortbread Recipe - Gutom Na! Posted on Wednesday, September 28th, 2016 at 5:32 pm. To prepare shortbread, cream together butter and sugar using electric beater. After that add sifted flour and mix using spatula till the batter becomes uniform. Spread this batter into the greased and dusted rectangular pan (11×7-inch). Level the batter layer by pressing the batter firmly and make it even from top using back of spoon. Bake in preheated oven at 350 degrees F for 20 mins. or until toothpick inserted from the center comes out clean. Meanwhile shortbread is baking, prepare caramel syrup for the bars, for that you need to combine all the ingredients of caramel sauce and cook over medium-low heat for 15-20 mins. Keep stirring in between so that mixture would not burn and the caramel gets even golden color. When the caramel is ready cool it to room temperature. Now apply the caramel layer onto the prepared shortbread layer and then refrigerate for 10-15 mins. until it sets nicely. After that make a layer of melted chocolate on top and refrigerate it again to set the bars. 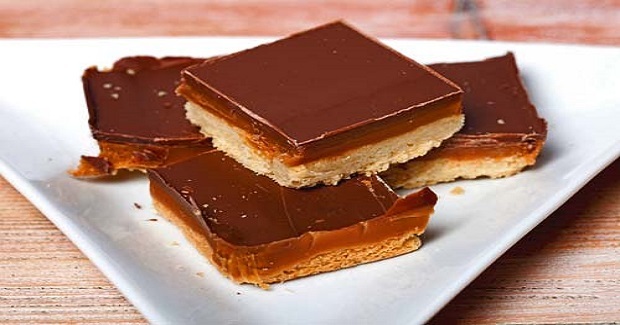 When all the layers get firm and set nicely, cut the caramel chocolate shortbread into bars.